Description: If your class is ever bored, hostile, aggressive or just not quite right, this teaching improvement manual is for you! Packed with proven tips for making small class teaching more effective, it is full of advice that is easy to apply and aimed at solving day-to-day teaching problems quickly. 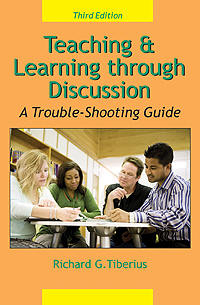 Well organized and designed to help lift flagging classroom morale and interaction, the book provides specific practical suggestions for a broad range of problems that teachers of all age groups regularly encounter, including: • dealing with problems of group goals, whether goals are unclear, unattainable, or unacceptable; • solving problems of group interaction, whether the group lacks interaction, is dominated by the group leader, or fails to share the interaction; • motivating the group and yourself when either begins to “tune out” or when students don’t cooperate. About the Author: Richard Tiberius has taught at many levels in education from public school through to postgraduate courses, and is well known for his expertise in faculty development.